Winterfell awaits the arrival of the royal party: Queen Daenerys Targaryen, her army of Unsullied, Dothraki bloodriders and of course — the dragons. Bringing her to the North is Jon Snow, “King in the North” until not too long ago. 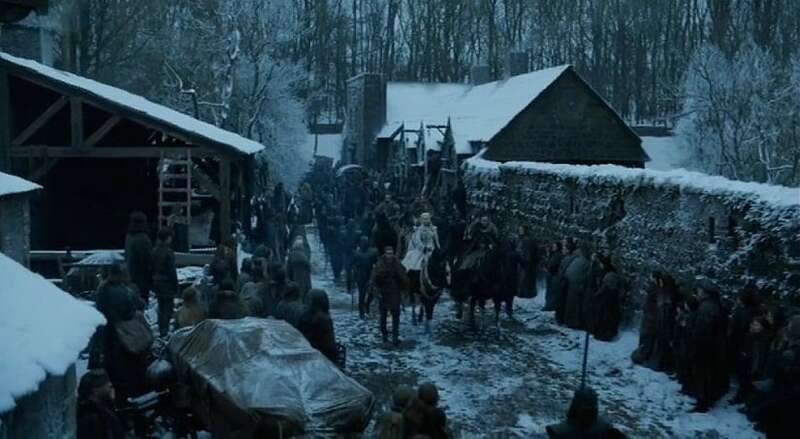 In a flashback to the very first episode of season one of Game of Thrones, we see a little boy, scampering here and there, trying to get to a vantage point to look at the arriving royalty. Arya smiles indulgently at the child, remembering her own excitable self when King Robert Baratheon came visiting. As she stands on the road along with the smallfolk, she sees Jon riding up on his horse: she wants to call out to him, but does not. Maybe he looks too much like a lord and not enough like the loving brother she knew. Her gaze is then caught by the Hound (whom she last left, dying somewhere in the Vale) and Gendry (who was toted away by Melisandre to the Dragonstone after the Brotherhood without Banners gave him up). And then her attention — just like everyone else's — is taken up by the dragons, two of them, soaring above the ramparts of Winterfell. 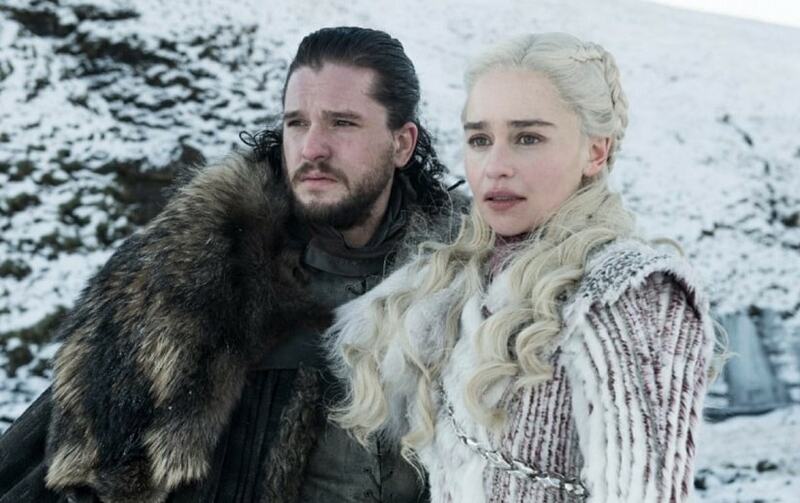 Jon Snow and Daenerys enter Winterfell. Screen grab from Hotstar. Inside Winterfell, Sansa awaits. Jon rides into the courtyard and the very first person he sees is Bran, in a wheelchair. He rushes to him, and hugs him, and Bran's less than enthusiastic response throws him off a little. Then, Daenerys is introduced to Sansa, who offers her a cool and perfunctory welcome. Bran announces that they do not have time for pleasantries. The Wall has fallen. The Night King is on the march, and he has Viserion. Everyone convenes in the Great Hall. Sansa has asked all their bannermen to pull back into Winterfell. Little Lord Umber says the last of his people and goods are to be transported, which he will oversee. Lady Mormont points out that the last time they saw Jon he was a King and now no one knows what he is. 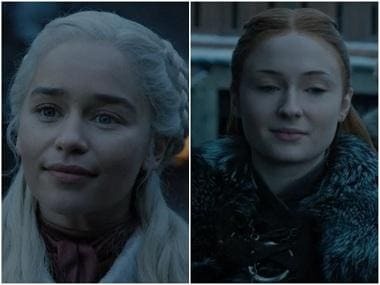 Rising tension between Sansa Stark and Daenerys. Image from Twitter. Jon reiterates that protecting the North is his only objective and he doesn't care about being a king. He has brought back a powerful ally, who will aid them in the fight against the White Walkers. Tyrion chimes in as well, pointing out that Daenerys has the greatest army the world has seen and two full grown dragons. Sansa says they provisioned for winter. Not for Dothraki, Unsullied and two full grown dragons. What do dragons eat anyway? she asks. “Whatever they want,” Daenerys replies. Tyrion meets Sansa and she apologises for disappearing on him during Joffrey's wedding. Tyrion says he understands, it was hardly a wonderful event. “Well it did have its moments,” she quips. They acknowledge that each of them is a survivor. In the godswood, Arya comes up to Jon. They hug and he sees she still has Needle. He asks her if she ever used it, and she replies: “Once or twice”. He then shows her his sword — Longclaw — and asks if she's jealous. They hug again. 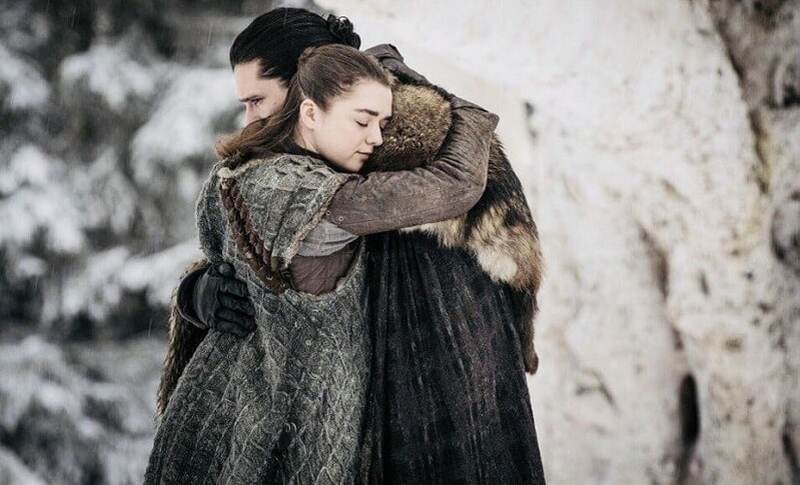 Arya and Jon's reunion. Image from Twitter. At King's Landing, Euron Greyjoy brings in the Golden Company across the Narrow Sea. Yara is a prisoner in his galley. Euron asks for his reward, and while Cersei intially blows him off, she later assents to sleeping with him. Henasks ribald questions about how he compared to the other men in her bed, and Cersei sends him on his way. Qyburn finds Bronn in a brothel and tells him Cersei will pay handsomely the man who hunts down her treasonous brothers. Theon launches a stealthy attack on Eurin's galley and frees Yara. As they sail away, Yara tells Theon they'll take over the Iron Islands while Euron is away in King's Landing. Yara realises Theon wants to go to Winterfell to fight for the Starks. She tells him to do what he must, and reminds him: “What is dead, may never die”. Davos speaks with Tyrion and Varys of the Northeners' distrust of outsiders like Daenerys. He hints that one way would be to have a matrimonial alliance between Jon and Daenerys. The two people in question chat cosily in the distance, unaware of what Tyrion, Vars and Davos are discussing. The dragons are not eating. 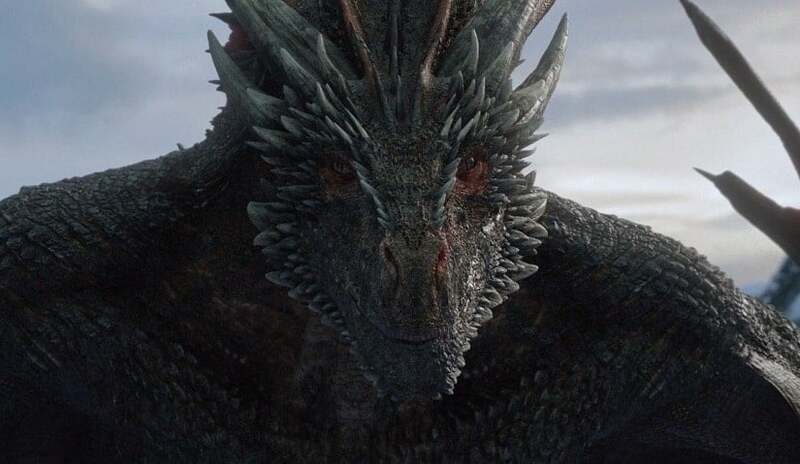 Daenerys and Jon go to see them and as Drogon is petted by Dany, Rhaegal too puts his about forward for Jon. Daenerys suggests that Jon try to ride the dragon, and he manages to climb on just as Rhaegal takes off. A mediaeval fantasy epic version of a rollercoaster ride plays out as Rhaegal soars above the wintry landscape with Jon hanging on for dear life. Jon and Daenerys disembark and kiss. Jon notices that Drogon looks at him threateningly. Drogon looks threateningly at Jon Snow. Screengrab from Hotstar. Jon speaks with Sansa, who is upset that Lord Glover has withdrawn his support and decided to stay back in Deepwood Motte. 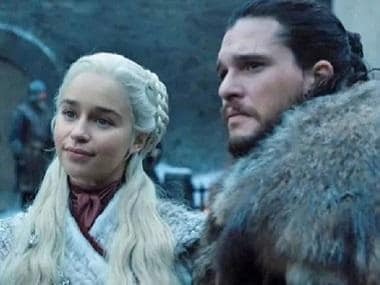 She say the Northeners had promised to follow Jon, not Daenerys. Jon asks Sansa if she has faith in him. She replies that she does. But she also asks him if he bent the knee to Daenerys because he truly felt that was the best course of a room, or because he fell in love with her? Arya meets the Hound and Gendry in the castle forge. The Hound and she have a prickly exchange of words which carries perhaps an undercurrent of affection. With Gendry, she is sassy and affectionate as he calls her “milady” in a reference to their last conversation. Jorah brings Daenerys to Sam, as she wants to thank him for curing Jorah of the greyscale. As they speak, she realises Sam is Randyll Tarly's son. She informs him of his father and brother's deaths — because they refused to bend the knee. Distraught, Sam asks to be excused. In the courtyard, he runs into Bran who tells him it is time to reveal to Jon what they know of his parentage. Sam meets Jon in the Winterfell crypts. The two friends hug and Jon realises Sam is upset. Sam tells him that Daenerys executed his father and brother. Jon is taken aback. Sam then tells Jon that he and Bran have pieced together Jon's past, with some help from an archmaester's diary and some from “whatever Bran does”. Jon is the son of Lyanna Stark and Rhaegar Targaryen; his proper title is Aegon VI of House Targaryen, King of the Andals, Rhoynar and First Men, Lord of the Seven Kingdoms and Protector of the Realm. Jon doesn't believe Sam. He says Ned, the most honourable man in the world, would never have lied to him about paternity. Sam says it was to protect Jon from being murdered by Robert Baratheon, and because Ned had promised Lyanna. He then asks Jon: you gave up your crown for your people. Would Daenerys do the same? Jon Snow and Daenerys' Targaryen. Screen grab from Hotstar. Jon doesn't have an answer. Making their way from the Wall to Winterfell, Tormund and Ser Beric come to the house of Lord Umber. It is abandoned and in complete disarray. As they creep down the hallways, they hear a sound and prepare to attack — but it is only Edd along with a few other survivors of the Night's Watch. They enter the hall and find the little Lord Umber has been nailed to a wall, surrounded by mutilated arms. His bright blue eyes open — just like the Wildling girl Will finds in 'Winter Is Coming’ — and he shrieks and writhes. Ser Beric sets the wight afire. 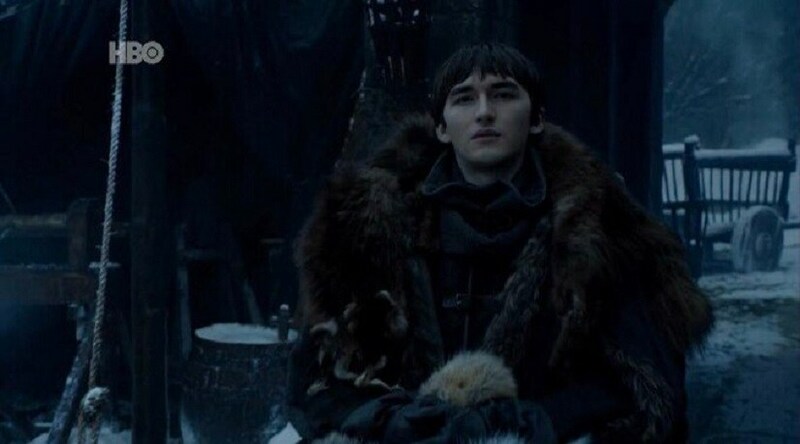 Bran waits for Jamie to arrive at Winterfell. Image from Twitter. Jaime reaches Winterfell. He looks around with a smile. Then he sees Bran in his wheelchair, staring right at him.